Entering Kinkakuji Temple. In style. Slowly completing my Asia bucket list as I finally visited the land of my dreams, Japan. Also the land of Sailor Moon (managed to hunt down zero merch) and Pokémon (didn't have time to visit the Pokécenter or my babes Chansey though). And for future reference, 5 days is not enough. We arrived at Kansai airport in Osaka and caught the Haruka Express to Kyoto. We also got Hello Kitty edition ICOCA cards, which are like the London Oyster/HK Octopus, but cooler of course because they are HELLO KITTY. The train and card package for tourists is cheaper online and in advance, but we're idiots and left everything to the last minute. 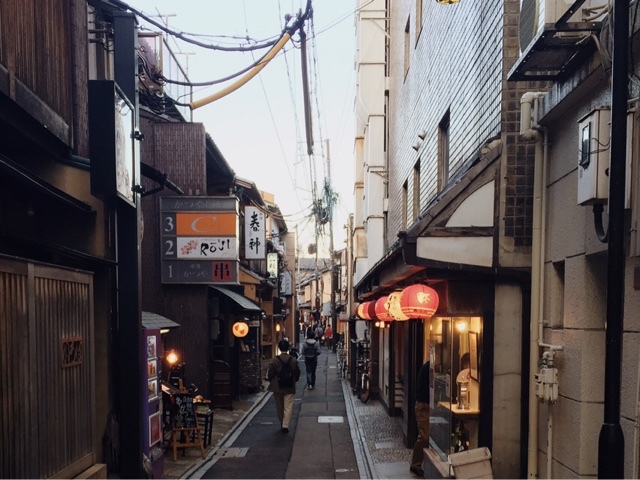 We arrived late into the zestful heart of Kyoto city where we'd booked a tiny Airbnb apartment and where I fulfilled my Japanese dreams of sleeping on futons and tatami mats. I also had my first Japanese toilet experience and, let's just say, I screamed and decided that having my a-hole washed by a sharp jet of water from the toilet is not really my thing. The first morning in Japan was hectic; finding lockers at the station to dump our suitcases in amidst rush hour. We got the... subway? JR line? train? There's so many lines that I can't even remember. Japanese public transport is not for the inattentive foreigner e.g. when you need to catch the Karasuma line towards Kokusaikaikan to Kita-Oji but there are a billion other lines with equally as many syllables. Then we got the bus to Kinkakuji Temple where we spent a while hunting down our kimono rental and getting lost in a maze of Anime-esque houses and autumnal views. Our kimono lady (let's just call her Maiko; it was something like that) ended up having to come find us and wouldn't stop 'gomenasai'-ing, despite it not being her fault that I couldn't find the place. The kimono rental was a traditional Japanese machiya which was over a hundred years old. The front room displayed a myriad of kimonos, in which I opted for a baby pink one because I'm sickeningly girly like that. Maiko led us to the back of the house, where we passed the dreamy little garden with flowing water and a raised wooden walkway, and up the stairs to the dressing room. About 23 layers later, she'd finally helped us put on our kimonos. In hindsight, I should've had my hair done too, but limited time! 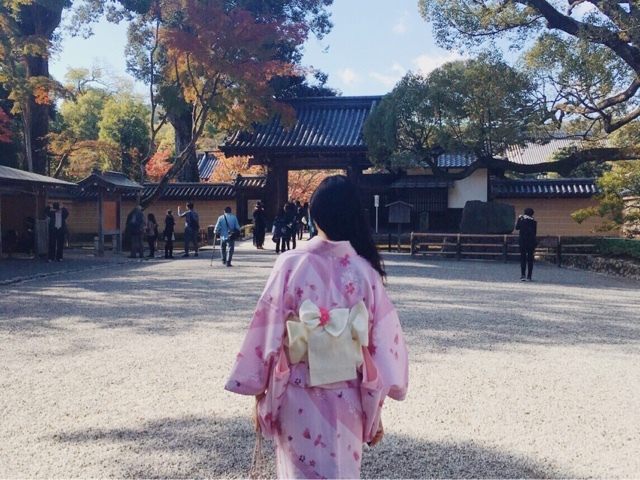 We scuttled to Kinkakuji Temple in our little, and really uncomfortable, pairs of zori. The famous Golden Pavilion was a pretty view, but it was super crowded and I was kinda all hot and bothered in my kimono and getting all paranoid about other tourists staring at us. Because, yeah, there weren't many people wearing kimonos... And then we could see tourists taking our pictures and then other tourists were asking us to take pictures with them. Ahem, I'm a tourist too. Now my unphotogenic face is probably floating round on loads of Europeans' Facebook walls. After, we moved on to Gion, the most famous geisha district in Kyoto, because I was the itinerary planner (hehe) and Memoirs of a Geisha is one of my top books. Here, EVERYONE was in kimonos. We went exploring around the Shirakawa Area (and saw the Tatsumi-bashi bridge), Pontocho Alley, the canal and Higashiyama for Shouren-In's Illuminations. And that was our one day in Kyoto. Which wasn't enough. Which means I now need to go back to Kyoto to visit the Kiyomizudera Temple. And the bamboo forest. And Uji. And Fushimi Inari-taisha. Pontocho Alley before it got seriously crowded.